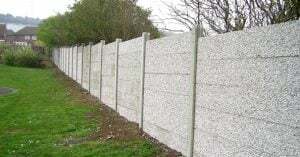 Concrete panel walling provides a very high level of durability and strength. This long-lasting fencing only requires low maintenance. The concrete panels come already set so the installation process is very fast and convenient with minimal disruption to your site. Concrete panels are easy to clean & are very robust. Concrete panel walling can be used in a wide range of domestic spaces and industrial sites. They are commonly used for agricultural livestock areas.